i) What is meant by "Mind is without fear"? Whose mind is the poet talking about and why? Answer i). Mind is without fear means fearless mind . The poet Rabindranath Tagore is talking about the mind of his countrymen . He prays everyone in his country should be fearless because the British had ruled India and reduced it to a subjugated nation. ii)What is meant by : 'the head is held high'? Why is the head bowed down and needs to be held high? Answer ii.Head is held high means having self respect. The poet's countrymen heads are bowed down because of the British who are ruling over them. The head should be held high in self respect without having any fear of oppression or compulsion. iii) What does the poet mean by " Where knowledge is free"? What were the restrictions imposed on the spread of knowledge? Answer iii)Where knowledge is free means There is distribution of knowledge. The distribution of knowledge are being restricted by narrow ideas and loyalties. Education is the monopoly of rich and affluent. iv)What according to the poet, were the effects of the restrictions imposed on the spread of knowledge? Answer iv) According to poet the restrictions imposed on the spread of knowledge had very much effects on the people of India. Education became the monopoly of the rich and affluent category. The Indians were considered in the category of poor people. iv)What is sonnet? How is the poem a part of sonnet? Answer iv) Sonnet is a poem of fourteen lines through which the poet used to express the total ideas, thought or sentiments. Sonnet consists of two parts , viz octave ( which is first eight line) and the sestet ( last six lines) . As India was under the subjugation of British rule , They were stripped off all political social and economic rights. Therefore in this poem Rabindranath Tagore is praying to God for Indians for their rights and livelihood. Tagore dreamt of a country where the people could held their heads high with pride and self respect. Knowledge ge must not be bounded for particular category of people. It should be free to all. i) What does the poet mean by saying 'tireless striving'? What does the poet want his countrymen to achieve by tireless striving? Answer i) Tireless striving mean working tirelessly and trying hard to achieve something. The poet wants countrymen to achieve perfection in everything they do and having the capability of reasoning , leaving aside superstitious beliefs and rituals that was very much prevalent in the atmosphere of those days. ii)Explain why "reason" has been compared to a clear stream. Answer ii)The clear stream means clarity of thought and the poet here wants that reason should be given with clear thought and should not be engulfed by superstitious thought. iii)What is meant by dreary desert sand of "dead habit"? Answer iii)The dreary deset sand of "dead habit" means a place where old customs and outdated traditions are followed by the people. iv)What according to the poet are the hurdles in achienging perfection. Answer iv) According to the poet the hurdles in achienging perfections are superstitious beliefs, old customs and outdated traditions. Theses things engulf the brain of Indians during the rule of Britishers. v) Point out and explain figure of speech in the third line of given extract. Answer v.The figure of speech used in the third line of the extract "into the dreary desert sand of dead habit" is alliteration. Here the consonant "D" has been reapeted to emphasis that the countrymen had been laid astray from their goal in a place where outdated traditions and customs are followed by them. vi)How can it be said that the poem is a "song of prayer"? 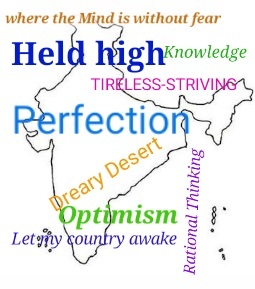 Answer vi.The poem "Where the mind is without fear" is a song of prayer as it is seen in every line that the poet prays to almighty for fortunes for his country. The country is under the subjugation of Britishers and their rights have been snatched from them. Therefore he prays for his country where countrymen could live with pride and self-respect.